Participation is open. Participants are kindly requested to send an e-mail to Mrs Nicole Umlas (numlas "at" mathi.uni-heidelberg.de) not later than Monday, January 29, 2018. Please indicate whether you wish to participate in the conference dinner on Monday. If you want us to book a hotel room, please mention this in your e-mail to Mrs Umlas. We may have some funds to support the hotel costs. 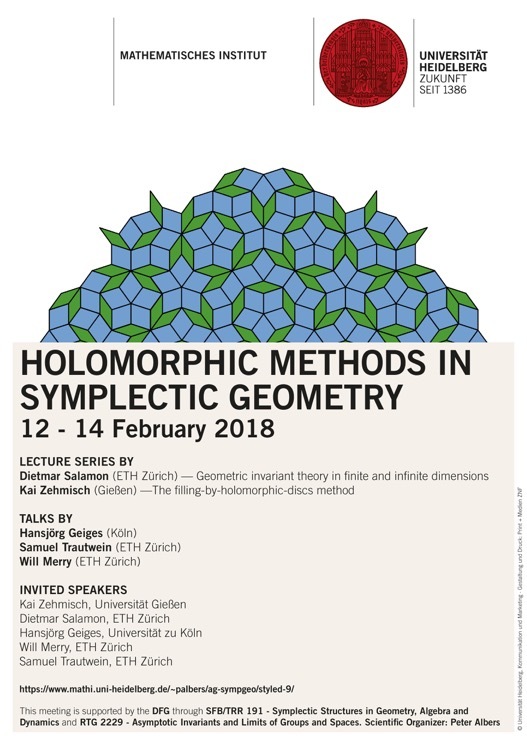 This meeting is supported by the DFG through SFB/TRR 191 - Symplectic Structures in Geometry, Algebra and Dynamics and RTG 2229 - Asymptotic Invariants and Limits of Groups and Spaces . In 1968 Cerf proved his celebrated result stating that all diffeomorphisms of the 3-sphere extend to a diffeomorphism of the 4-ball. Based on his classification of contact structures on the 3-sphere Eliashberg proposed in 1992 to use Gromovʼs holomorphic curves technique to give a contact theoretic proof of Cerfʼs theorem. In this lecture series I will present the analytic details of Eliashbergʼs proof of Cerfʼs theorem based on a joint paper with Geiges from 2010. In lecture 1 I will show how to reduce Cerfʼs theorem to symplectic geometry via Eliashbergʼs classification theorem. In lecture 2 main concepts from contact geometry will be introduced in order to understand the standard holomorphic disc filling of the 3-sphere. In lecture 3 I will demonstrate how analytic tools from elliptic PDEs can be used for an actual extension of a given diffeomorphism of the 3-sphere. In this talk I will provide some differential topological background for the lectures by Zehmisch. In particular, I will outline Smale's proof that the diffeomorphism group of the 2-sphere retracts to the group of isometries.